When Caroline Brimmer moved her family to the Lake District, she assumed outdoor play would come easily. But when only a small number of kids play outside every day, it turns out we all have a lot to learn. Here are her tips to help you get out more. Each year, more toys, games, books and new technologies become available for our children. Play is serious business. Yet, the loser in the pie-chart of the average child's day is unstructured time spent outside. Up until the 1970s, 71% of children played outside on the street or in an area near their house every day. Today it’s 21%. Hand-wringing aside, there are reasons to believe this matters. Learning to play is a crucial life skill. In fact, it is only recently that we’ve started to understand how unstructured play shapes children’s development and mental health. I’m sure she is right but it doesn’t necessarily follow that the skills needed to do so come easily. Two years ago my husband and I moved with our two small children from Hackney in East London to the Lake District. Hackney is one of London’s greener boroughs. I’d appreciated this in aesthetic terms pre-kids, but it wasn’t until I had my daughter that I’d delved beneath the surface to explore each park in detail. Brisk walks with a buggy to persuade her to sleep; the minute exploration of every pebble and leaf only a toddler can inspire; daily trips to the playground to wring out every last bit of energy pre-bed. Then a second baby arrived and the call for more space and better access to grandparents drew us North. Undoubtedly, swapping gated patches of greenery for unfettered access to real wilderness was part of the appeal. At last, I thought, I could stop worrying about traffic fumes, dog poo and needles and allow my children to grow wild and free. As someone who grew up in a city, my knowledge of flora and fauna is poor. But I've always loved being outdoors. I never questioned how to interact with nature. And I presumed a desire to do so was hard-wired into every child. It turns out it isn’t quite that simple. Once the initial thrill of our new home wore off, I was frequently faced with cries of “where’s the playground?” and “I don’t want to go outside”. But outside was pretty much all there was. 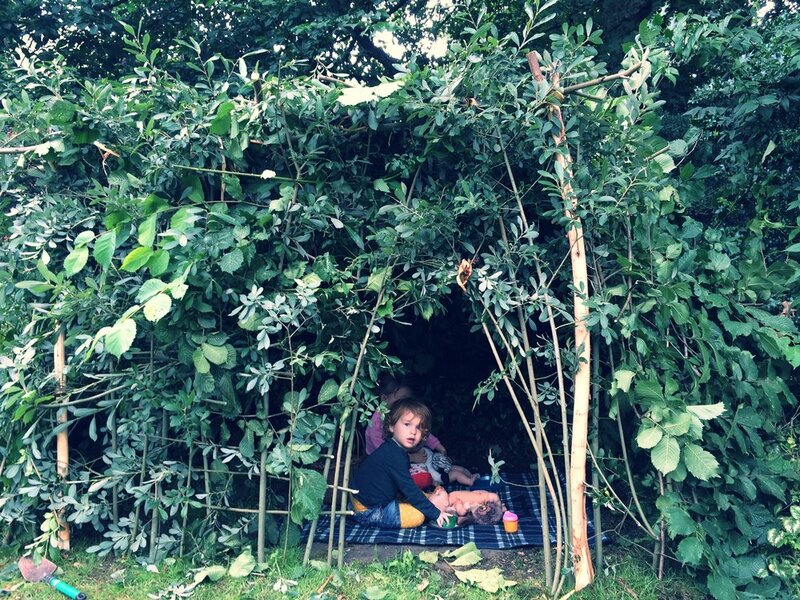 Den-building, kite-flying, pond-dipping, cloud-spotting, knot-tying and whittling have become trendy in recent years. And of course, there are a plethora of books, blogs, equipment and kits that parents can consume. Many of these are great. But together they both highlight and obscure the central issue. The point isn’t to create more adult-led, structured activities. Rather it's to empower children to feel at home enough outdoors to make their own discoveries. This takes regular and prolonged exposure. Organised sports and activities certainly get kids outside. But they also add to a world already dominated by planned lessons and extra-curricula activities. The physical, mental and social benefits of these are clear, but they come at a cost. Kids learn to distinguish between work and play early. This includes work dressed up as play. Whenever there is a planned outcome, especially one designed by an adult, it is work, even when its fun. By contrast, unstructured outdoor play throws children back on their own resources. They must develop their own interests, away from gender stereotypes and consumerist agendas. Adventure, destruction, observation, understanding, nurture or creativity? Children can experiment with ways of interacting with the world, and with different parts of themselves. There is no fixed goal. It took me a 300-mile move to the remote wilds of the countryside to realise the most important part of Carson’s statement. The beauty isn’t as necessary as taking proper time to look for it. For us, having fewer options to fill our time meant as much as the awe-inspiring views. So, two years in, the children are a little older and quite a bit grubbier. They still seize upon playgrounds whenever they can. But a subtler change has come over them. They are more at ease with nature and, on good days, I like to think, a little more at ease with themselves and with each other. Cherish time outdoors without a plan. Notice and observe. Embrace boredom. Be ok with the discomfort of not knowing what to do next. Get kids playing outside for part of every day. Leave time to dawdle on the way to school or the shops. Get the kit to be outside whatever the weather. Look up. Look down. Alter the scale. Make use of all your senses. Every interaction with the world - staring out the car window or waiting for a bus - holds the possibility of discovery. You can’t expect children to regulate this themselves. The internet is a wonderful resource but not at the expense of everything else. Take chalks out. Carry paper & crayons to make rubbings. Collect and display nature's bounty at home. Grow a seed. The biggest single factor influencing children’s behaviour is you. Turn off your screens. Get outside yourself. Be prepared not to know the answers to their questions but enter into the spirit of trying to find out.